After much deliberation and soul searching, I decided the Bob Sport Utility stroller (SUS) fit the criteria best. Out of the box It was easy to set up and get ready to roll! We had to buy the baby seat specific holder separately, but it is just a bar that snaps right in so the car seat fits just like a regular stroller. The tires are nice and wide, with a smooth rolling surface along the middle with more aggressive lugs along the edges for serious off road traction. It is easy to remove the wheels and fold it up for transportation, but it doesn’t really get very small when compared to our everyday stroller. Fitting it in the back of my truck is easy, but stuffing it in a trunk is tedious and doesn’t leave much room for the 50 pounds of other baby essentials we seem to travel with. On the road it runs true and I haven’t had to adjust the front wheel alignment, but it looks easy should the need arise. At running speed the suspension is great and I don’t worry about waking her up when we hit a bump or have to jump up on a sidewalk. 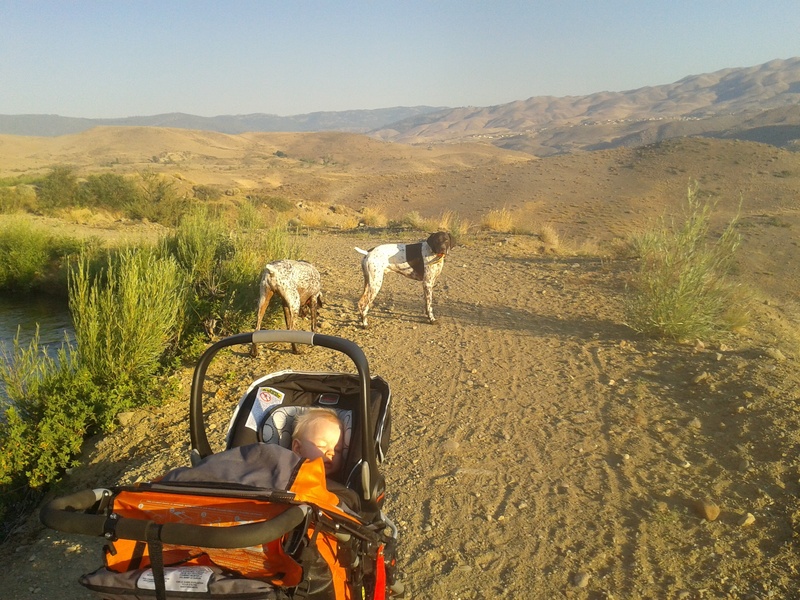 Since it is too wide to fit on single track, we haven’t given it a true trail workout, but it has performed very well on stroller accessible trails. The built in cover keeps out light rain, but the baby would probably have more than a wet diaper in a downpour. If we didn’t already have an everyday stroller, the SUS would definitely not cut it since it is so hard to make a sharp turn in tight spaces with the fixed front wheel. I can imagine canned goods rolling everywhere while trying to navigate through the grocery store. So far, I am happy with the way it performs after being used vigorously for 6 months. It does exactly what it is supposed to do, but has some drawbacks if it is used for more than a jogging stroller. Disclaimer: we paid full price for the stroller and no one told us what to say in this review.